​Randy Travis, is an American country music singer, songwriter, guitarist, and actor. Since 1985, he has recorded 20 studio albums and charted more than 50 singles on the Billboard Hot Country Songs charts, and 16 of these were number-one hits. Considered a pivotal figure in the history of country music, Travis broke through in the mid-1980s with the release of his album Storms of Life, which sold more than four million copies. The album established him as a major force in the neotraditional country movement. Travis has sold over 25 million records, and has earned 22 number-one hits, six number-one albums, six Grammy Awards, six CMA Awards, nine ACM Awards, 10 AMA Awards, eight Dove Awards, and a star on the Hollywood Walk of Fame. In 2016, Travis was inducted into the Country Music Hall of Fame. On July 7, 2013, Travis was admitted to a Dallas area hospital for viral cardiomyopathy after a viral upper respiratory infection. His condition was classified as critical. Three days later, Travis suffered a massive stroke and had surgery to relieve pressure on his brain. On July 15, 2013, it was reported that Travis was awake and alert after undergoing brain surgery, that his heart was pumping without the assistance of machines, and that he was on the road to recovery. He was released from Baylor Heart Hospital in Plano, Texas on July 31, 2013, and entered a physical therapy facility. Immediately following his stroke, including intense physical therapy and rehabilitation, Travis had been unable to sing or speak and had difficulty walking. As of November 2014, he was slowly recovering, could walk short distances without assistance. In 2016, he attended his induction into the Country Music Hall of Fame on October 16, 2016, where he performed a beautiful rendition of Amazing Grace. Currently, Randy has difficulty speaking and is unable to walk or care for himself without assistance. 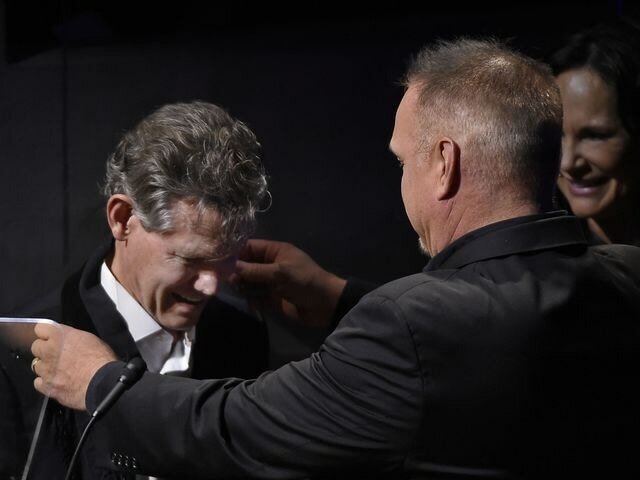 The Randy Travis Foundation is a 501(c)(3) non-profit dedicated to raising awareness for viral cardiomyopathy and providing arts and music enrichment for children. The Randy Travis Foundation is part of the Leadership Development Council, Inc., a Texas non-profit.